There's something for every young jigsaw fan in this four-puzzle set, with rainbow-hued images of unicorns, dinosaurs, and planets; even the penguins here perch on an extra colorful ice floe of crystal blues and purples. And as if that weren't enough, these 100-piece puzzles glow in the dark, further enhancing their mysterious charm. (For an extra challenge, try mixing up all the puzzle pieces!) 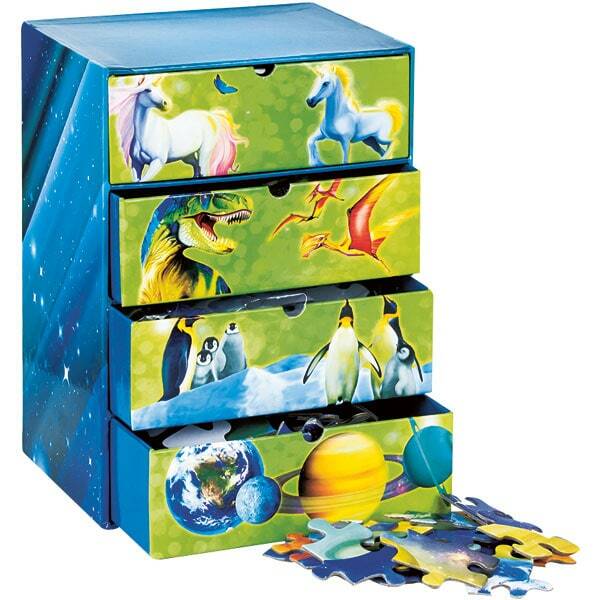 An ideal gift for puzzlers 5 to&apos;, the set is presented in a laminated cardboard storage chest with four pull-out drawers. Each puzzle measures 19 × 14 inches when finished, and the chest itself stands over 10 inches tall.